Past winners include David Tittsworth, W. Scott Simon, Ron Rhoades and Eugene Maloney. Skip Schweiss, TDAI's head of advisor advocacy. The Committee for the Fiduciary Standard said Thursday that Skip Schweiss, TD Ameritrade Institutional’s (AMTD) managing director of advisor advocacy and industry affairs, has been selected as Fiduciary of the Year. The committee presented the award to Schweiss at Insights 2015, an annual conference hosted by fi360, in Orlando. First awarded in 2011, the Fiduciary of the Year Award aims to recognize the individual who has made outstanding contributions to advance the vital role of the fiduciary standard in serving the best interests of investors, as well as restoring trust in the capital markets and those who provide investment advice, according to the group. Earlier winners include David Tittsworth, the former executive director of the Investment Adviser Association; W. Scott Simon, a columnist with Morningstar; Ron Rhoades, a professor of Alfred State College, and Eugene Maloney, corporate counsel of Federated Investors. “Particularly now, as the discussion heats up, we are very fortunate to count Skip’s voice among leading fiduciary advocates,” McBride added. “I am truly humbled and honored to be recognized in this way by the Committee for the Fiduciary Standard. The list of those who have gone before me is impressive, and I enjoy every day sharing thoughts, ideas and action with the incredibly dedicated professionals on the committee,” said Schweiss, in a press release. Schweiss, who also serves as head of TD Ameritrade Institutional’s retirement plan services, has spent more than 10 years of appearing before Congress, regulators and the courts in support of advisors, according to the company. 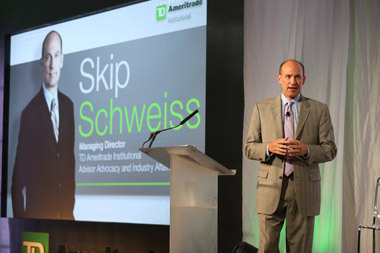 For the past two years, Schweiss organized TD Ameritrade Institutional’s Fiduciary Leadership Summit. “I’m grateful for the support from my firm, TD Ameritrade, in standing for the best interests of investors in advice relationships, and I will continue to work tirelessly until those objectives are realized. Investors deserve our support,” he added. TD Ameritrade Institutional says it recently announced plans to launch an advocacy resource center and communication tool that will make it easier for independent advisors to keep up to date on policy issues, contact their legislators and express their views on important regulatory matters. The firm provides brokerage and custody services to more than 4,500 fee-based, independent registered investment advisors and their clients. The Committee for the Fiduciary Standard was formed in June 2009 by an all-volunteer group of investment professionals and fiduciary experts.